I had the day off and since we cleaned the house this weekend, I didn’t have a whole lot to do. I decided that since T actually had to work today, he might enjoy coming home to a home cooked meal. 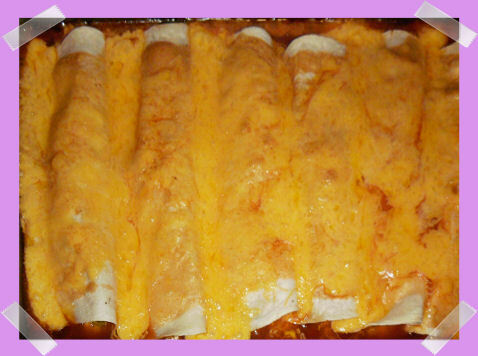 (Those of you who know us know that my cooking is usually reserved for baking…) I found a recipe for Chicken Enchiladas on my favorite recipe site that has a 5 star review with almost 500 reviews – it would be hard to mess this up! I got 5 stars and 2 thumbs up from T and he wants me to make it for the next family gathering. 2. Heat the butter in a skillet over medium heat. Stir in the onion; cook and stir until the onion has softened and turned translucent, about 5 minutes. Add the shredded chicken, chopped green chilies, taco seasoning, chopped green onion, and water. Allow to simmer for 10 minutes. Stir in the lime juice, garlic salt, and 1 cup of the soup mixture; simmer for an additional 10 minutes. 3. Preheat an oven to 350 degrees F (175 degrees C). Spread the remaining soup mixture on the bottom of a 9×13 inch baking dish. 5. Pour enchilada sauce evenly over the enchiladas. Cover with the remaining 1 1/2 cups of Cheddar cheese. Sprinkle the reserved chopped green onions and the sliced olives on top of the cheese. Bake in the preheated oven until filling is heated through and the cheese is melted and bubbling, about 15-20 minutes. This entry was posted on Monday, May 3rd, 2010 at 7:05 PM	and is filed under Cooking. You can follow any responses to this entry through the RSS 2.0 feed. You can leave a response, or trackback from your own site.